Memedroid is a free app for Windows 8 and 8.1 which brings to your device a large collection of memes. When you run the app, you will be shown a brief tutorial of using the app and upon completion of the tutorial, you will be brought to the main screen of the app where you will be displayed rib tickling funny memes. 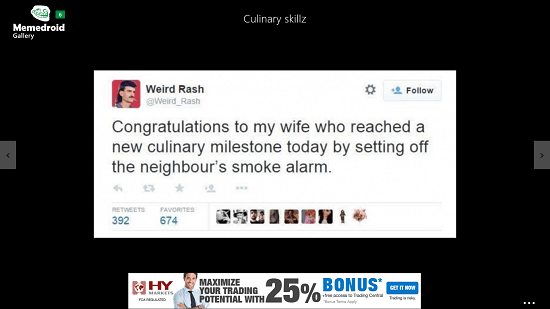 You can scroll between memes by clicking on the navigate buttons on either the left or the right side of the screen, and the action bar can be accessed via a right click. The app is well designed and well optimized for all devices with Windows 8 or above. 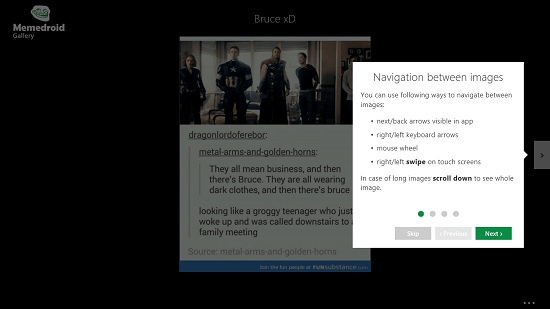 Memedroid is available for free from the Windows App Store. The main screen of the app which shows up on your device is displayed in the screenshot below. The above screen is the splash screen of the app. What follows is a screen which shows you a brief tutorial of using the app itself. You can navigate between the tutorial interface by clicking on the next button at each prompt. Once the tutorial is through, you will be shown the interface of the app which allows you to browse through the memes. The app logo shown at the top left corner of the screen shows a small counter. This number counter keeps a track of how many new memes are available to be displayed. You can click on this logo to display more memes. Long story short, the app requires an active internet connection to run and when available provides you with a variety of memes which are sure to tickle your funny bone! 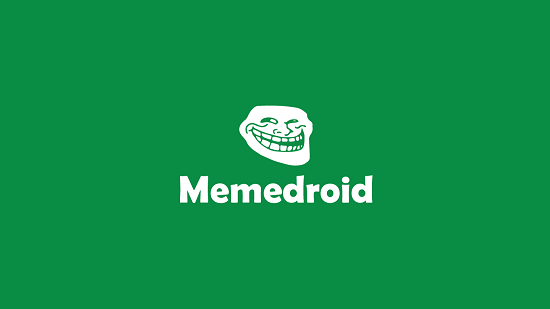 Memedroid is a freely available app which can be downloaded for free for your device by heading over to the Windows App Store. You can do this by heading over to the link attached below.